Happiness is a choice, not a result. Nothing will make you happy until you choose to be happy. No person will make you happy unless you decide to be happy. Your happiness will not come to you. It can only come from you. Remember most of the stress comes from the way you respond, not the way life is. Adjust your attitude and all that extra stress is gone. ఈ ప్రపంచం లో మీ దగ్గర లేకపోయినా ఎంతమందికైనా పంచగల ఒకే వస్తువు సంతోషం. Even if you have nothing with you, you can still share happiness to others. Over thinking kills your happiness. You can’t control everything just let it be. Hey Buddy!, I found this information for you: "Be Happy And Make Others Happy – Good Morning Quote on Happiness". 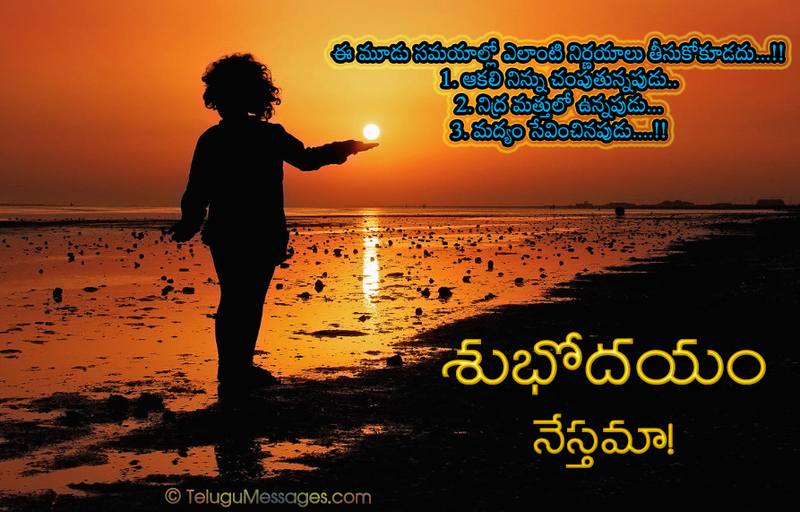 Here is the website link: https://www.telugumessages.com/2017/12/09/happy-make-others-happy-good-morning-quote-happiness.html. Thank you.